These Green Chile and Bacon Crescent Rolls are brought to you in collaboration with General Mills® to help bring you easy recipes to include in your holiday traditions! As always, the recipe and opinions in this post are my own. With the holidays fast approaching, many of us are gearing up for traditional celebrations, whether it's our own traditions or traditions as hold with family or with friends. This year Pillsbury® wants us to share our traditions as well as make new traditions! It seems like our Christmas traditions grow every year! Right now, our current tradition is to celebrate Christmas both on Christmas Eve and on Christmas Day! On Christmas Eve, we have brunch at my parents with just my immediate family where my mom makes prime rib, then we go up to Joe's parents' in Santa Fe for an open house where all of their family and friends gather for frito pies and posole. Then on Christmas Day, Joe's mom makes a traditional meal for a smaller gathering and then we head back to my family's for Christmas Dinner with my extended family where we usually have enchiladas! Now that my brother owns a house, he's been hosting Christmas Dinner and we've added on a white elephant exchange! Those are two busy days, no? With so much going on, I'm finding myself looking for more simple and easy dishes to make and incorporate. Our families hold tight to traditional foods, but we totally embrace the addition of a new dish! 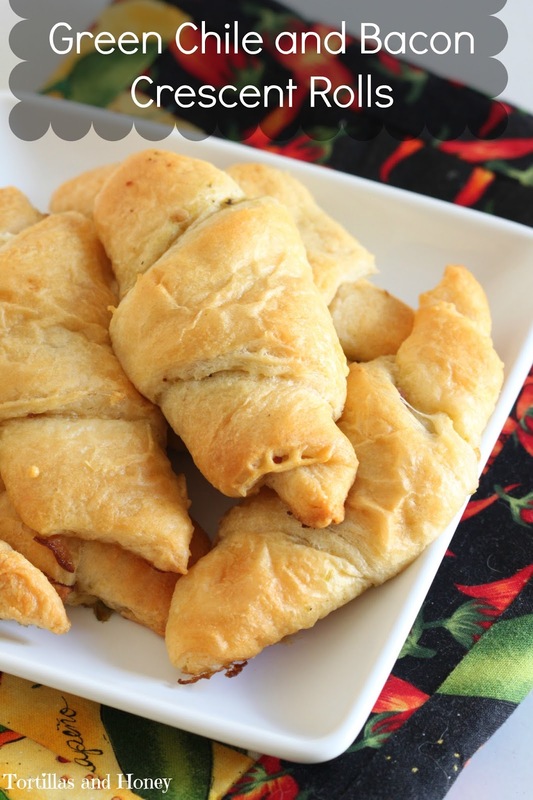 Today I am sharing with you these Green Chile and Bacon Crescent Rolls. These are a twist on the popular tortilla spirals filled with cream cheese and jalapenos-- or if you're in New Mexico, green chile! I decided to change things up a little bit and add bacon for some added protein, and use Pillsbury® Cresecents that I found at Walmart as the bread! And while Joe may disagree with me, I know many of you will agree that everything is better with bacon! The great thing about these rolls is that they are so versatile. Use turkey bacon, sausage, leftover turkey or ham, or add some scrambled eggs to make these a little more hearty for a breakfast! Or add some jam to make these rolls sweet and savory! These Green Chile and Bacon Crescent Rolls are great to have for a simple breakfast, an easy snack or appetizer, or a great side bread to serve with your meal! And they are so good and easy to prepare, you'll make them year-round and not just for the holidays! What are some of your traditional foods that you prepare during the holidays? Spray baking sheets with non-stick cooking spray. Remove both rolls of dough from the package and unroll both of the large sheets of dough. With a knife, gently follow the seams of the dough, separating the dough into 16 triangles. Spread cream cheese evenly on both of the sheets of dough, followed by sprinkling the bacon pieces and green chile on top of the dough. Gently roll up each of the triangles, starting opposite of the triangle tip, then ending with the tip of the dough. Place on prepared sheets and bake 12-15 minutes or until the rolls are a deep golden brown. Remove from oven and let cool about 5 minutes before serving. 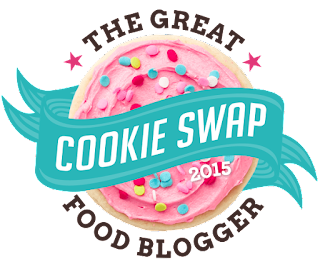 It’s another year of one of my favorite times of year, The Great Food Bloggers Cookie Swap! This is my fourth year participating and I look forward to this every year. 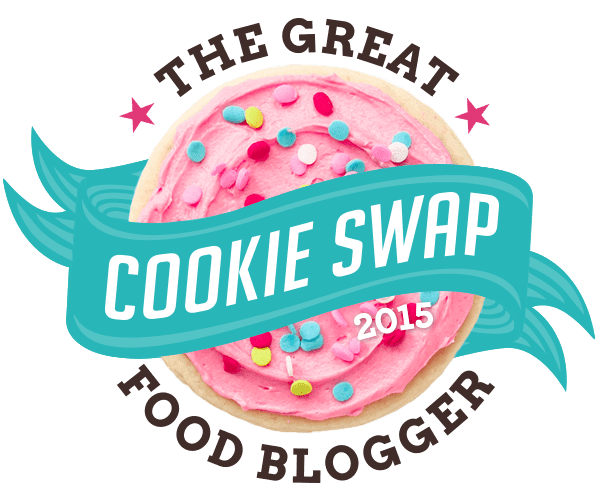 Not only do I get to sample some wonderful cookies, it’s also an opportunity to meet new bloggers and be introduced to some amazing new (to me) blogs! This event also helps to raise money and awareness for Cookies for Kids' Cancer! One of the challenges for me when choosing a cookie make for this swap is that the cookies need to be sturdy enough to withstand the postal service as well as a cookie that can withstand being at room temperature until it arrives. I had so many different ideas, but the more I thought about them the more I wasn’t sure if they would be the right recipe. I’ve never been so stressed out on deciding on the perfect cookie, I don’t know what’s going on with me this year! I finally decided on Mandelbrodt from Mindy Segal’s Cookie Love, which is one of my favorite cookbooks. I love the originality of all her recipes and I’ve been having a blast baking all of her creations. 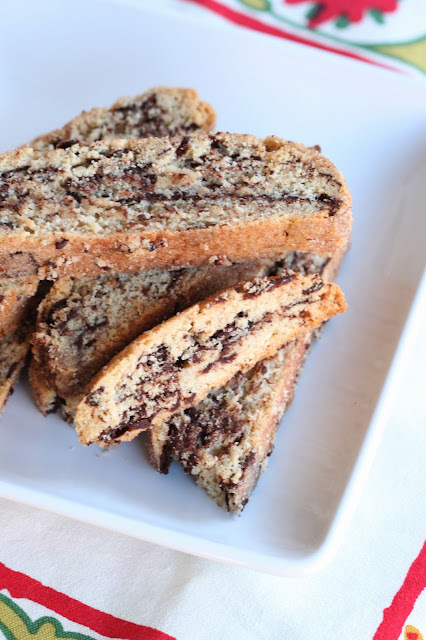 Mandelbrodt is like a Jewish version of biscotti and everyone who has tried them as fallen in love with them. They are a sturdy cookie and can be at room temperature for up to two weeks, so these fit everything I was looking for. And plus these are so so good and they’re fun to look at with all of the chocolate ribbons! Just like traditional biscotti, these take a little time to make because these are double baked. 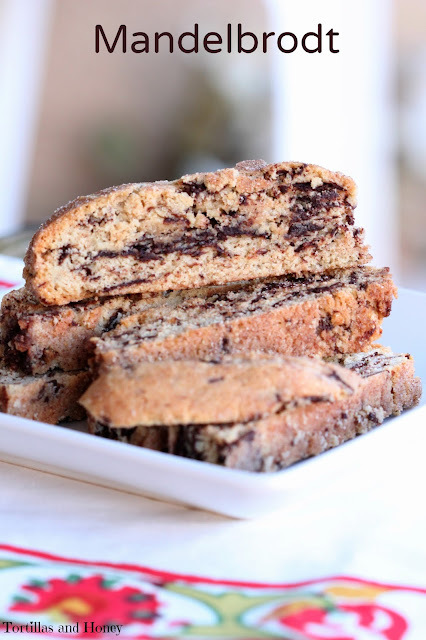 One of my favorite things about this recipe is that it has layers of chocolate inside! This is done by melting chocolate, then spreading it on a cookie sheet and freezing it until it’s hardened. Then it’s folded into the batter which causes the chocolate to be broken into shards which creates the awesome chocolate ribbons! These cookies also have cinnamon and are covered in a cinnamon sugar coating, and I just love the combination of the cinnamon and chocolate! This is a wonderful cookie to give out to friends and family or to include in your cookie baskets. I hope that you love this recipe as much as me and my friends and family! What cookies are you baking this year? Please check out these participating bloggers whom I either sent cookies to or received cookies from! There are some excellent bloggers and recipes involved in this campaign! Invert a baking sheet and spray with nonstick cooking spray. Line the top with parchment paper. With an offset spatula, spread the melted chocolate evenly across the parchment. Place the baking sheet in the freezer until firm, about 30 minutes. In the bowl of a stand mixer fitting with the paddle attachment (or using a hand mixer), mix the butter briefly on medium speed 5-10 seconds. Add the sugar and beat until the butter mixture is aerated and pale in color, about 4 minutes. Scrap the sides and bottom of the bowl with a rubber spatula to bring the batter together. Crack the eggs into a cup or bowl and add the vanilla. In a bowl, whisk together the flour, baking powder, salts, and cinnamon. On medium speed, add the eggs and vanilla to the butter mixture, one egg at a time, mixing the first briefly before adding the second, until the batter resembles cottage cheese, about 5 seconds for each egg. Scrape the sides and bottom of the bowl with a rubber spatula to bring the batter together. Mix on medium speed for 20-30 seconds to make nearly homogeneous. Add the dry ingredients all at once and mix on low speed until the dough comes together but sill looks shaggy, about 30 seconds. Do not overmix. Remove the bowl from the stand mixer, if using. With a plastic bench scraper, bring the dough completely together by hand. Using a plastic bench scraper, fold the sheet of chocolate into the dough until it is "ribboned" throughout. It will break up into shards. Transfer the dough to a sheet of plastic wrap, pat into a rectangle, and wrap tightly. Refrigerate at least 2 hours or preferably overnight. Heat the oven to 350 F. fine a half sheet (13 x 18-inch) pan with parchment paper. Divide half the dough in half. Roll each half into a log nearly the length of the half sheet pan. Spread the cinnamon-sugar across a work surface and roll the logs in the sugar several times. Each log should be generously coated in the sugar. Transfer the logs to the prepared pan and pat down slightly. Bake, rotating the pan halfway through the baking process, until the tops are firm when pressed, 30-35 minutes. Let cool for 20 minutes on the pan. Lower the oven temperature to 300 F.
Transfer the logs to a cutting board. With a serrated knife, cut the logs crosswise while still warm into 3/4-inch thick mandelbrodt. Put the mandelbrodt on the sheet pan side by side so that the cut sides face out (they should fit snugly all on one pan). Bake until lightly golden brown, 20-25 minutes. Cool completely on the pan. The mandelbrodt with keep for 2 weeks in an airtight container at room temperature. Welcome to a special post today! I am participating a bloggers International Cookie Exchange hosted by Sarah from Curious Cuisiniere and Camilla from Culinary Adventures with Camilla. For this exchange, bloggers choose a different recipe from around the world to make and create a post to share with others! This is such an exciting cookie exchange for me because not only do I love to try different recipes, but I love to also try foods from different cultures. Every year I give away cookie platters to friends and family. There are a couple of staples that I make every year (bisochitos, chocolate crinkle cookies, white chocolate cranberry macadamia orange fudge), but I am always trying to incorporate new and different recipes every year. I also take note throughout the year of different cookies that I can give away as well. So for those of you who want to switch up your cookie platters, this is a great event to get some new ideas now with the holidays fast approaching! For this exchange, I decided to make Alfajores, which are short bread cookies filled with dulce de leche. These cookies originate from South America, notably Argentina and Chile. The shortbread is made with a cornstarch and flour base, which helps the cookies be light and easy to bite into; the texture of the cookies are amazing! The dulce de leche I used is store-bought, which is a great shortcut for those of us who are very busy especially around holidays! 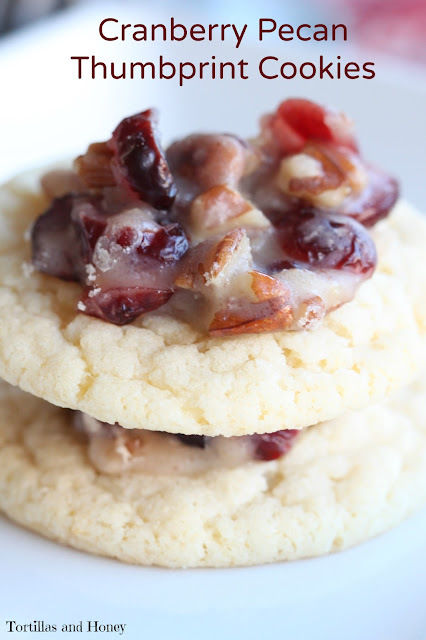 You can also use the shortbread cookies as a base for different fillings... I'm imagining a dulce de leche and raspberry filling, yeah? I stayed true to the recipe and didn't alter it very much except that I didn't have pisco or brandy, so I decided to use a light rum which I had on hand which was a great substitute. What cookies do you make for cookie exchanges? What international cookies do you make? Please check out these other international cookies from these wonderful bloggers who are also participating in this International Cookie Exchange!! You can follow along on Twitter with the hashtag #IntnlCookies, and you can find these great recipes and more cookies from around the world on the International Cookie Exchange Pinterest Board. Place the cornstarch, measured flour, baking powder, baking soda, and salt in a medium bowl and whisk briefly to combine; set aside. Place the butter and sugar in the bowl of a stand mixer fitted with a paddle attachment. Mix on medium speed, stopping the mixer to scrape down the sides of the bowl once with a rubber spatula, until the mixture is light in color and fluffy, about 3 minutes. Add the egg yolks, pisco or brandy, and vanilla and mix until incorporated, about 30 seconds. Stop the mixer and scrape down the sides of the bowl. On low speed, gradually add the reserved flour mixture and mix until just incorporated with no visible white pockets, about 30 seconds. Turn the dough out onto a piece of plastic wrap, shape it into a smooth disk, and wrap it tightly. Place in the refrigerator until firm, at least 1 hour. Meanwhile, heat the oven to 350°F and arrange a rack in the middle. Line 2 baking sheets with parchment paper and set aside. Remove the dough from the refrigerator, unwrap it, and place it on a lightly floured work surface. Lightly flour the top of the dough. Roll to 1/4-inch thickness (the dough will crack but can be easily patched back together). Stamp out 24 rounds using a plain or fluted 2-inch round cutter, rerolling the dough as necessary until all of it is gone. Place the cookies on the prepared baking sheets, 12 per sheet and at least 1/2 inch apart. Bake 1 sheet at a time until the cookies are firm and pale golden on the bottom, about 12 to 14 minutes. (The cookies will remain pale on top.) Transfer to a wire rack to cool completely. 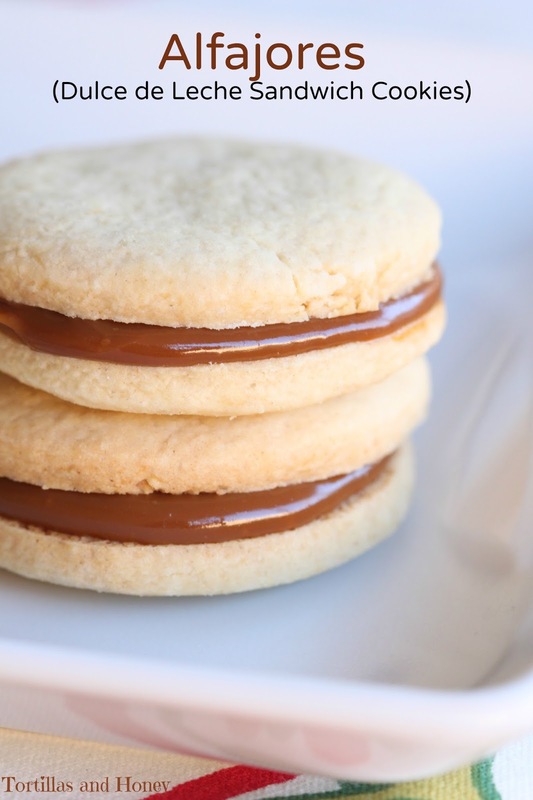 Flip half of the cookies upside down and gently spread about 2 teaspoons of the dulce de leche on each. Place a second cookie on top and gently press to create a sandwich. Dust generously with powdered sugar before serving. Welcome to another month of The Book Club Cook Book Cooking Crew! This month Erin from The Spiffy Cookie is hosting and she chose Harry Potter and The Sorcerer's Stone. I was absolutely thrilled when I saw that Erin chose this book because the Harry Potter series is one of my favorite book series and I've been so intrigued by the idea of butterbeer and other edibles from the books. I was introduced to these books in high school and have been hooked ever since! I used to babysit my art teacher's children and her daughter insisted that I borrow her Harry Potter books and read them. Honestly, I had absolutely no interest in reading them. I didn't know what the books were about and I didn't want to read a kid's book, but I couldn't disappoint my teacher's daughter, so I read the book and was instantly pulled into the books! I devoured them and tried to get my family and friends into them as well. One of the things I love about the Harry Potter series is that it really got kids excited about reading again, which I think is wonderful. I really struggled decided what to make for this month's selection. I wanted to try the treacle tart that Erin featured, but I also wanted to try the very much talked about butterbeer. From my understanding, butterbeer didn't appear in this book but I couldn't help myself and had to try a butterbeer recipe. I finally chose to make these Butterbeer Cupcakes, which has a butterscoth flavoring. I liked this recipe because it is thoroughly infused with butterscotch! It has a butterscotch filling, a butterscotch buttercream frosting, and is drizzled with additional butterscotch. I know it could sound like overkill, but it all really works wonderfully. I didn't make many changes to this recipe except that I decided to add rum extract to the cake and the frosting. I feel like it helped to brighten the flavors a little bit and it isn't too strong. Everyone I gave these cupcakes to fell in love instantly. 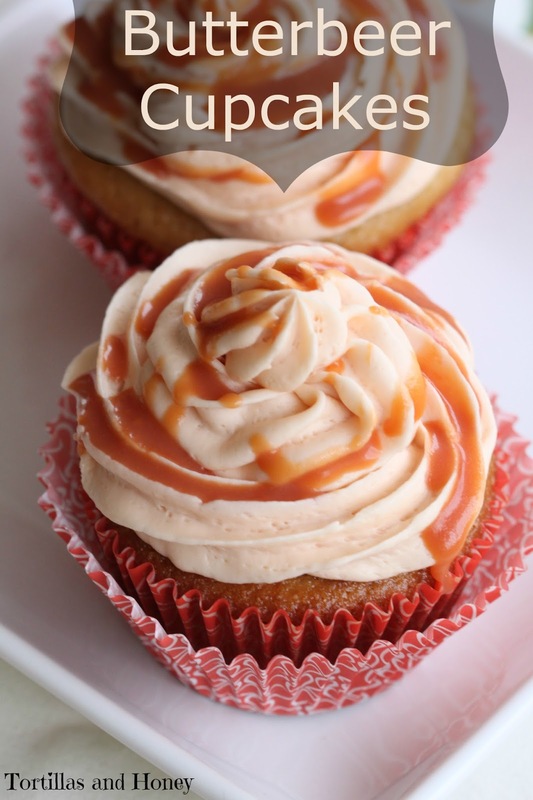 If you like butterscotch or love the Harry Potter series, I hope that you will give these cupcakes a try! They are fun and decadent! This month Erin at The Spiffy Cookie, this month's host, is giving away a copy of the book. * Enter to win a copy of the cookbook so you can join us in future months, if you wish! One of our lucky readers - US and Canada only! - can enter to win a copy ofThe Book Club Cookbook, Revised Edition: Recipes and Food for Thought from Your Book Club's Favorite Books and Authors by Judy Gelman and Vicki Levy Krupp, courtesy of Tarcher-Penguin. Giveaway runs from November 1st till November 30th at 4 o'clock PM, Pacific time. Please see terms and conditions in the rafflecopter widget below. Many thanks to Tarcher Books. You may find Tarcher: on the web, on Facebook, on Twitter, and on Pinterest. *Disclosure: Erin received a complimentary copy of The Book Club Cookbook, Revised Edition: Recipes and Food for Thought from Your Book Club's Favorite Books and Authors by Judy Gelman and Vicki Levy Krupp as an opportunity to give a copy away. Opinions are our own. We received no further compensation for our posts. Preheat oven to 350 degrees F (175 degrees C). Line a cupcake tin with 18 baking cups. Fold in 1/3 of the flour mixture, then the buttermilk, 1/3 of the flour mixture, cream soda, and then the remaining flour. Folding in these ingredients will prevent over-mixing and will result in a fluffier, less dense cupcake. Fill cupcake liners 3/4 of the way full and bake for 15-18 minutes, or until the cupcakes are golden and spring back when touched. Cool completely before frosting. Fill a pastry bag with butterscotch buttercream and pipe onto the top of each cupcake. Drizzle on the butterscotch ganache. We are already in our 4th month of The Book Club Cook Book Cooking Crew! The premise of this cooking crew is that each month a different blogger will host a different month and choose a book where other bloggers will participate by making and creating dishes inspired by the book. This month is being hosted by Wendy from A Day in the Life on the Farm, who chose "Three Junes" by Julia Glass. "Three Junes" is three different yet interconnected stories spanning three different Junes and are through the perspective of a different person with each story/June. Ashamedly, I have not yet finished reading the book but am about halfway through. I am conflicted about some characters, especially the mother in this book, I have to reserve any final judgement until I actually finish the book. There are a lot of different food and dishes talked about in the book; among them are Dennis' creations which sounded amazing and I thought about doing a version of one of his dishes from the book. I ended up settling on one of my favorite dishes that I make from Melissa D'Arabian's Supermarket Healthy. 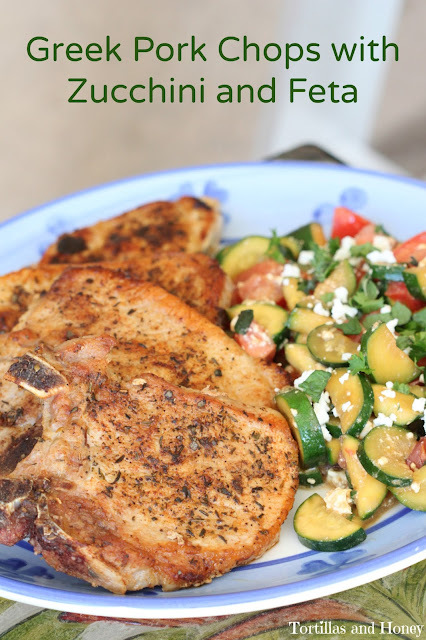 This dish probably isn't an authentic Greek dish, but it has Greek flavors mixed into the pork and zucchini which I absolutely love. What really convinced me to make this dish to contribute for this month isn't any spectacular, but I was craving this meal and was an easy meal for me to prepare. I should note that I've been taking an all-day Saturday class which is ongoing for two months, which really only leaves me one day off during the week. I've been finding myself scrambling to get everything done in that one day that I need to so this recipe was perfect and I've been wanting to share this recipe for awhile now! This meal is so easy to prepare and it takes less than half an hour to cook. Buy thin pork chops so that they cook through faster, then use the same pan to prepare the zucchini. What I usually do, which makes the zucchini appear a little darker in color, is pour the accumulated juices of the resting cooked pork chops into the pan with the zucchini for a little extra flavor. You can totally skip that part, but I find that it give the vegetables just a little extra flavor. Also, depending on the size of the pork chops, sometimes I double the ingredients for the rub. The chops that I tend to buy are very thin but very, very wide so I need to make a little bit more rub. So just use your judgement. I'll say it again that this is one of my favorite meals, and I'm so excited to share this with you today! I really hope that you make it and enjoy it as much as we do! The recipe is down below. This month Wendy at A Day in the Life on the Farm, this month's host, is giving away a copy of the book. * Enter to win a copy of the cookbook so you can join us in future months, if you wish! One of our lucky readers - US and Canada only! - can enter to win a copy ofThe Book Club Cookbook, Revised Edition: Recipes and Food for Thought from Your Book Club's Favorite Books and Authors by Judy Gelman and Vicki Levy Krupp, courtesy of Tarcher-Penguin. Giveaway runs from October 1st till October 31st at 4 o'clock PM, Pacific time. Please see terms and conditions in the rafflecopter widget below. Many thanks to Tarcher Books. You may find Tarcher: on the web, on Facebook, on Twitter, and on Pinterest. *Disclosure: Wendy received a complimentary copy of The Book Club Cookbook, Revised Edition: Recipes and Food for Thought from Your Book Club's Favorite Books and Authors by Judy Gelman and Vicki Levy Krupp as an opportunity to give a copy away. Opinions are our own. We received no further compensation for our posts. To season and cook the pork chops: Stir together the oregano, thyme, paprika, salt, and pepper in a small bowl. Set the pork chops on a cutting board and season both sides of each chop with the spice blend. Heat a large skillet over high-heat for 1 minute. Add the canola oil, and once it shimmers, add the chops. Reduce the heat to medium-high and cook, without moving the chops, until they are nicely browned, 3-4 minutes. Flip the chops and cook on the other side until browned and the centers resist light pressure, 2-3 minutes. Transfer to a plate and set aside. To cook the zucchini: Add the zucchini to the skillet with the salt and cook, stirring occasionally, until the zucchini softens, 3-4 minutes. (At this point, I'll also pour in any accumulated juices from the resting pork chops to give the zucchini a bit more flavor!) Stir in the herbs, the tomato, olive oil, lemon juice, and feta. Divide the zucchini among four plates and serve with the pork chops. 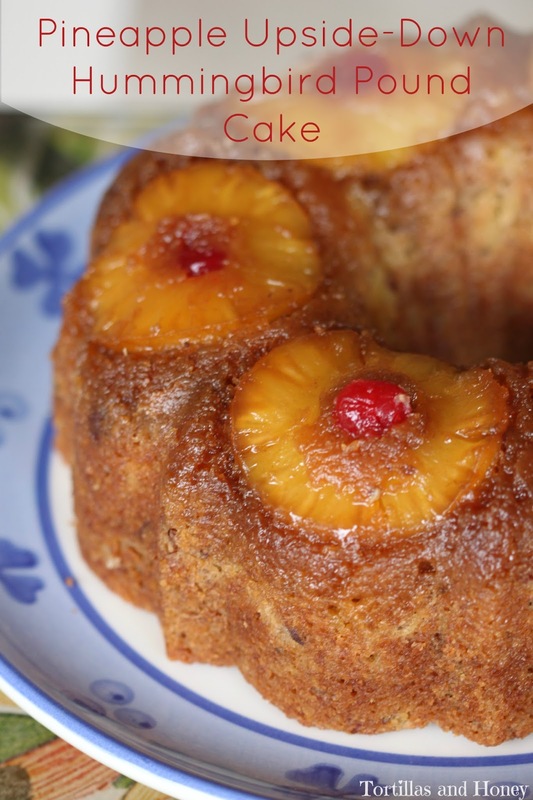 Today I am featuring a Pineapple Upside-Down Hummingbird Pound Cake from a fellow blogger, Jocelyn Delk Adams from Grandbaby Cakes, who just published her first cookbook! Jocelyn is one of my favorite bloggers who is as sweet as can be and is always publishing mouth watering recipes on her blog. I cannot wait to BAKE my way through her cookbook-- it's fabulously filled entirely with cake recipes! One of my favorite things that I love about Jocelyn is that she created Grandbaby Cakes as a tribute to her grandma, who is known for making incredible cakes. This touches my heart because my blog's name is a homage to my own grandmother whose recipes (and recipes inspired by her) I've featured on my blog. We lost my grandma this summer, so my blog's tribute to her is extra special. As I mentioned above, Jocelyn's cookbook is filled entirely with cake recipes and is separated into sections by type of cake: bundt cakes, sheet cakes, layer cakes, etc. She offers several fun twists on classic recipes such as this cake as well as Red Velvet S'more Cake, Coffee Toffee Pumpkin Cupcakes, Peach Cobbler Shortcake, and many more! I have been dying to make a homemade caramel cake for years and Jocelyn features two!! Both of which I cannot wait to make. When I make a caramel cake for the first time, I know that it will be one of her recipes. For my first recipe to bake from this cookbook, I was immediately drawn to this Pineapple Upside-Down Hummingbird Pound Cake. Dude, this is like two cakes in one! Pineapple Upside-Down Cake is one of my favorites and I adored how it was combined with Hummingbird Cake (which is a banana, pineapple, pecan cake) so I knew I had to try it. I only made a slight change to her recipe, which was to double the brown sugar and butter for the pineapple upside-down portion because I love the sauce it creates and I like it a little more sauce-y (it is reflected below)! I have a feeling that I'll be making this cake again very soon... probably within the next week or so! Please give this wonderful recipe a try and check out the charming Grandbaby Cakes cookbook! Preheat oven to 350. Spray a 10-cup Bundt pan with nonstick cooking spray. In a large bowl, whisk together the flour, granulated sugar, baking soda, cinnamon, and salt until combined. Add eggs one at a time, combining well after each addition using an electric mixer and scraping down the sides and bottom of the bowl as needed with a rubber spatula. Add the mashed bananas, crushed pineapple, oil, sour cream, and vanilla extract. Scrape down the sides and bottom of the bowl and mix the matter until just combined. Be careful not to overmix. Fold in the pecans using a rubber spatula and set the batter aside. Pour the melted butter into the prepared pan. Sprinkle with brown sugar. Line the bottom of the pan with pineapple rings and place one cherry into the center of each ring. (Note: The color of the maraschino cherries will bleed from its juice into the cake and the pineapple rings-- to prevent this, dry the cherries with a paper towel before adding it into the pan. It makes it just a little more pretty!) Pour in the batter, making sure to evenly and carefully cover the pineapple rings. Bake for 50-60 minutes, or until a toothpick inserted into the center of the cake comes out clean. Let the cake cool in the pan on a wire rack for 10 minutes, then invert onto a serving plate. Serve warm or at room temperature. One of our favorite past-times is tailgating, whether it's before a football game or after one of Joe's old softball games. And, of course, one of the things I am always in charge of is bringing food. 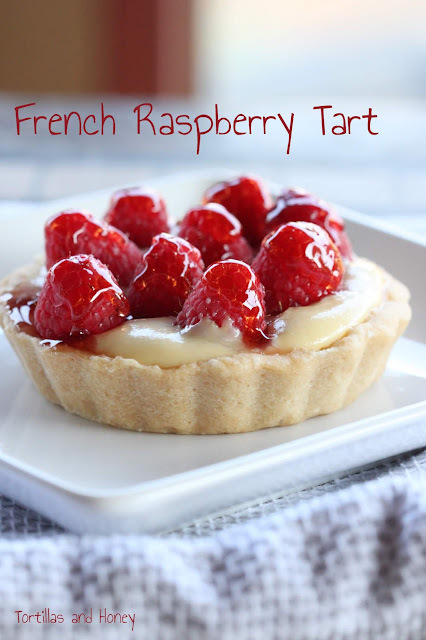 While I love to bring desserts, I am sharing with you one of our favorite recipes that I love to make. While I've done several different versions, of this recipe, but this particular recipe has managed to be one of our favorites! It's creamy, smoky, a little spicy, with a hint of garlic! 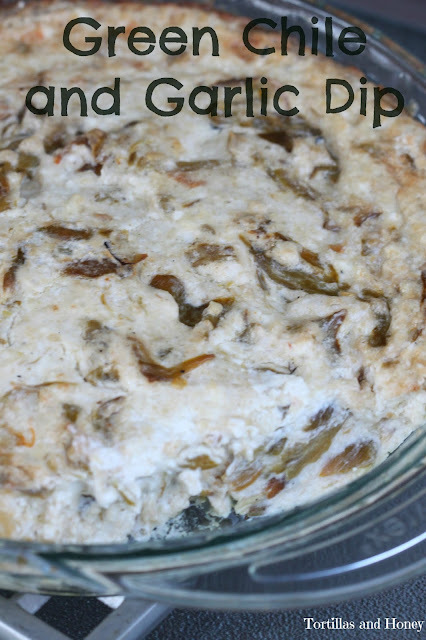 The last time I made this dip, I used fresh green chiles that I just bought that morning. 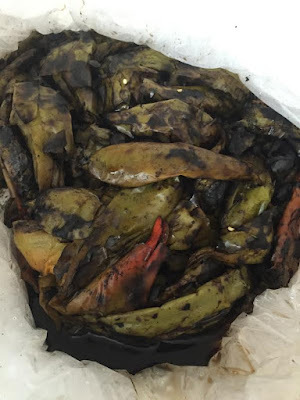 I bought an entire sack of chile and placed it on the counter when I got home so that I could peel and seed them. The natural juices leaked through the two bags the chiles were in and made an incredible pool all over my counter and managed to spill onto my just cleaned floor! 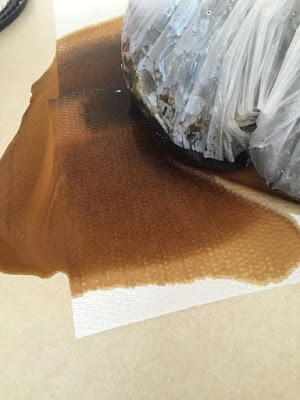 I had just purchased Viva® Vantage® Towels at Walmart that morning as well, and they made the cleanup of this hot mess (pun intended) all the more easy. These towels are very durable and are fiber-packed which help clean up some of the toughest messes. When I was cleaning up my chile mess, the towels did not break but soaked up the chile juice much like a cloth and it didn't tear! See evidence of the mess below... ugh. This recipe is incredibly easy to make. It only uses five ingredients and only takes a couple of minutes to put the ingredients together before you bake it. I usually bake this right before I leave, then cover it with aluminum foil and place it in a carrier-- that way it is fresh and piping hot when we arrive! Sometimes I'll prepare the dip, then place it in the refrigerator instead of baking it; then I'll bake it the next day before our event (this may take about 5-10 more minutes to bake). This dip is gluten free! For your gluten free guests, I like to serve with crinkle potato chips, but can still serve this with gluten free crackers or regular crackers for your guests if you're not serving gluten-free guests. As an added bonus, you can try these Viva® Vantage® towels towels with this coupon! It will help you save $1.00 on a 6 or 12 pack of Viva® Vantage® towels. So, tell me, what are your favorite tailgating recipes??? In a large mixing bowl, mix together the parmesan cheese, mayonnaise, and cream cheese until fully combined. Add in the garlic and the green chile, and mix until fully mixed in. Add mixture to a pie plate or 9x9 baking dish, bake 25-30 minutes or until the mixture is melted and the top is golden brown. Let cool for five minutes and serve with chips or crackers. Leftovers can be kept wrapped and placed in a refrigerator for about 2-3 days.